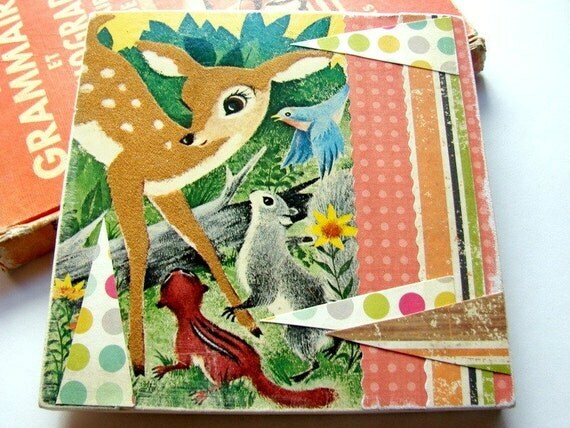 Little Deer and Forest Friends- An original paper collage on wood home decor wall hanging from Mimi and Lucy. A collage made with scrapbook papers and a vintage childrens 'fuzzy' book cover is decoupaged onto hand cut wood, then sealed with a clear acrylic spray. The wall hanging measures about 5 3/8" square and about 1/2" thick with a hole drilled into the back for hanging. Cute accent for a child's room, or any place that needs a little brightening. Folksy :: Buy "ACEO - Three little birds"